Best-ever braised kale. Betcha never thought you’d see those words together. Get ready to be a believer. 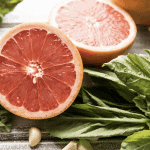 Already a lover of the this leafy green super food? It’s about to get 100% better. Well, I mean, Come. On. 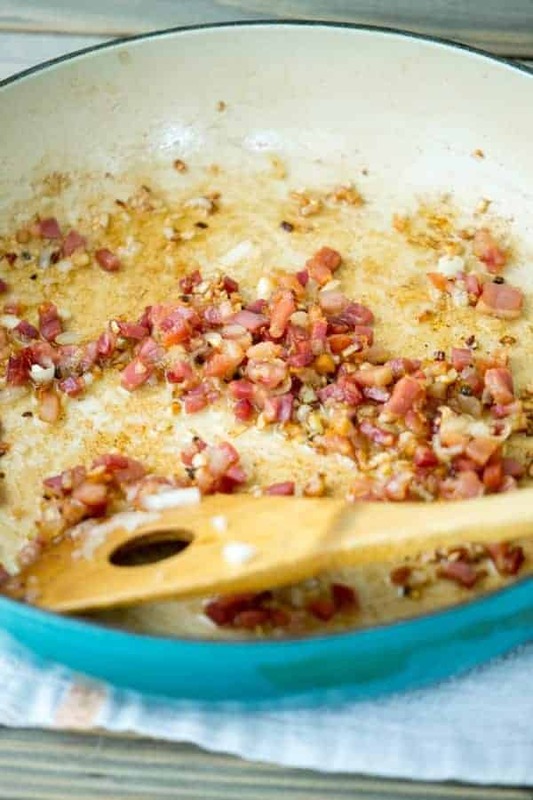 Add garlic, onion and pancetta to pretty much anything and it’s elevated. This posh vegetable is popular to an almost annoying level, but find your groove with it and you’ll understand the hype. A common occurrence in our household, kale is a daily for me an a 3-5x a week for the hubs. Even Baby Shea gets down with my breakfast kale smoothies. And though scoffed at in the beginning, there are never any left overs to pack up. I mean…just look at that green. Full of all things nutritious and delicious. Don’t get me wrong, this girl loves her cupcakes and deep fried goods as much as the next. But there’s just something about tucking into a bowl of this braised kale that makes my tummy and my taste buds unite like an unrehearsed, broadway worthy, flash mob. Maybe it’s the pancetta. Maybe. Ok, fine…it’s the pancetta. Bite-sized pieces of italian bacon bring just the right saltiness. 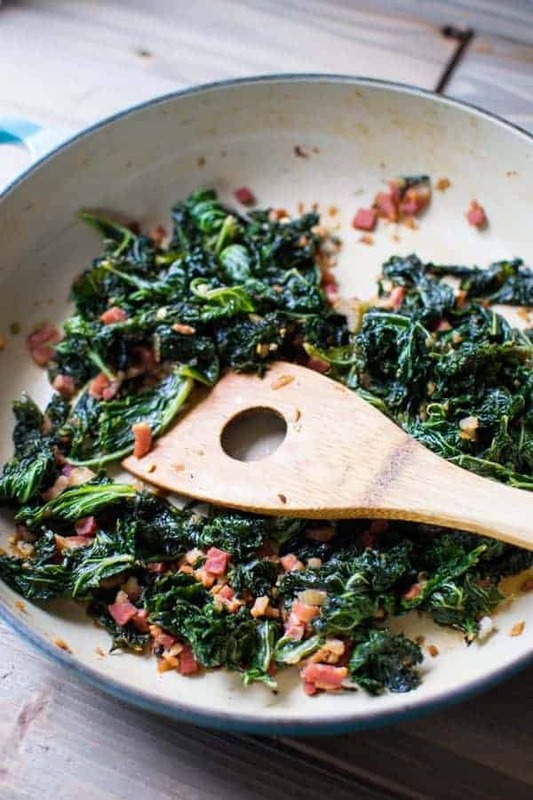 Shallots add sweet onion flavor and white wine provide the liquid to deglaze the pan and cook down the kale. A little red pepper flake adds just a touch of heat, but black pepper will work just as well if spicy is not in your wheel house. Beyond flavors, there’s a little more to kale than meets the eye. You can chop it raw for salad, blend it up for smoothies or cook it down for a veggie side. 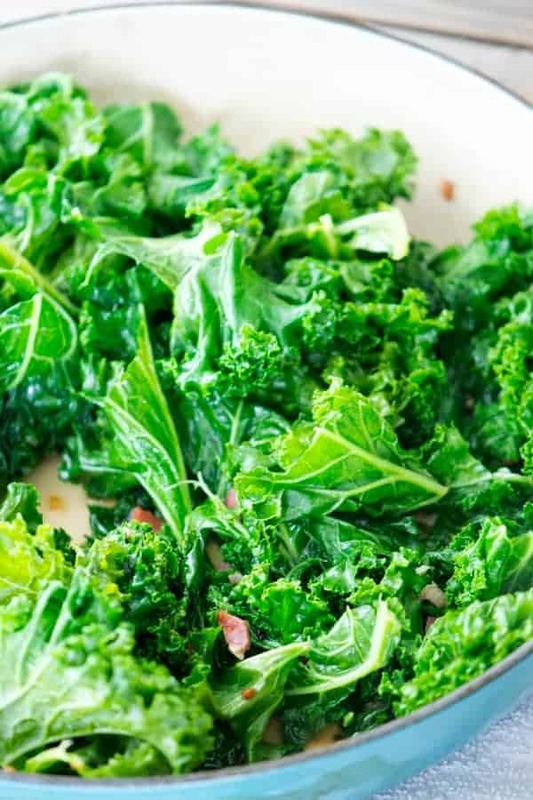 Here are a few of my tips and tricks for working with kale. Picking the right kale for the recipe. There are bunches of different kales (see what I did there?) to choose from. Some are sweet, some are spicy, most are a little bitter. I love lacinato or Tuscan kale for soup. Which is exactly what I used in this Tuscan Kale, White bean & Sausage soup. 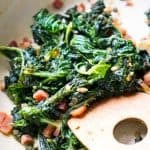 It’s far less bitter than curly kale and wilts fairly easily while keep just a tender bite. For braised kale, opt for good ole curly kale. It will retain a little bit of bite but not as much as purple kale, so it’s perfect for braising. Curly or purple kale is great for salads. A pop of color and great bite. Wash it. End of story. I’m practically the founder of the sometimes I don’t wash my produce club. It’s a step that sometime I forget, or I’m just lazy. “Whatever, it’s organic,” I say to myself. For kale though, that voice in my head comes through loud and clear with second warning. “Nobody likes sandy vegetables Lauren.” Even if organic, those curly kale leaves hide a lot so give it a quick rinse and pat down to be sure it doesn’t taste like you’re eating kale at the beach. Remove the stem. The stem or large vein that runs down the center of the leaf is uber bitter. What I’ve found in my friends and family research of kale haters is that the haters typically have only tried kale with the stem attached. For leafy, tasty kale remove the largest parts of the stem. It doesn’t have to be all the way to the top. Typically, my method is just rip the leaves right of the stem. So that’s the story of the best-ever braised kale, with a few little tips and tricks, my loves. I’m just a small town girl, living in a veggie world taking the midnight train to kale town. Heat a large sauté pan over medium-high heat. Add olive oil and pancetta. Cook for two minutes, stirring occasionally. Reduce heat to medium, add shallot and cook for 1 minute. Add garlic and cook an addition 30 seconds. Add the kale and cook for 1 minute. The leaves will sizzle a bit in the pan. Add white wine and red pepper, stirring so all the leaves are steamed by the white wine. Cook for 8 to 10 minutes until the leaves are soft and wilted and the wine is reduced. 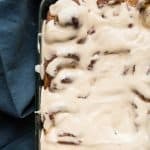 There should only be about 2 teaspoons of liquid in the pan. I can’t, for the life of me, eat kale. I despise the bitter aftertaste that reminds me of bittergourd. Maybe I’ll try this recipe, and see if I’ll have a change of heart! I’d love to hear your feedback! 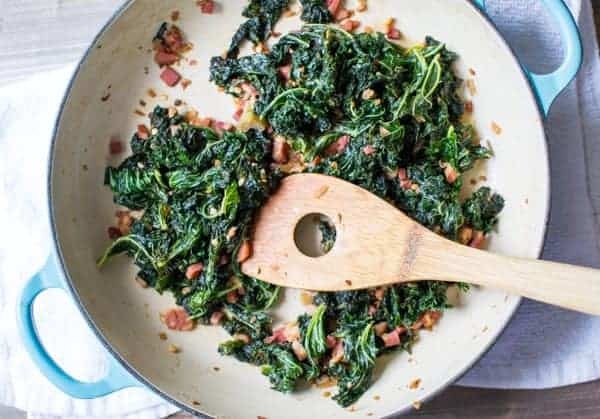 Though I do like kale as is, I feel like the white wine does a great job at pulling the bitter flavors out and replacing with all that pancetta, garlic, wine goodness. Thanks for your comment! I love kale. 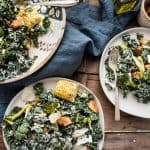 Was always so afraid to try it for people said it was bitter but I can eat Kale salads. 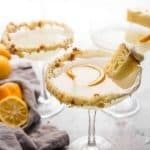 This looks good to try too. This looks so lip smacking good! 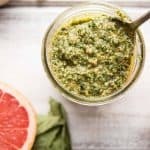 We’re always looking for a new kale recipe and this might be right up our alley, it looks great!